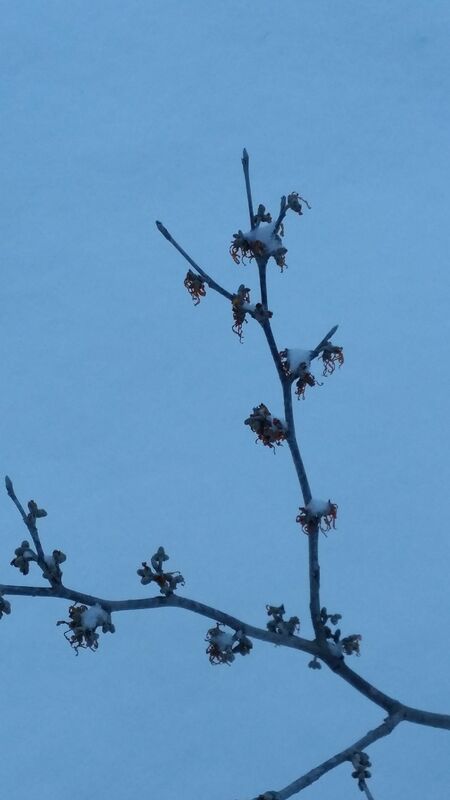 Last week some of the newly planted Witch Hazels (Hamamelis x intermedia ‘Jelena’) began to bloom. Right on schedule. Exactly as planned. They are the beginning of the planned grove of them at the front entrance, for their welcome winter color and fragrance. Yesterday it snowed, beautifully. Everything is clean and white and quiet. And even though my scientist, horticulturist mind told me they would be fine – it still seems amazing. 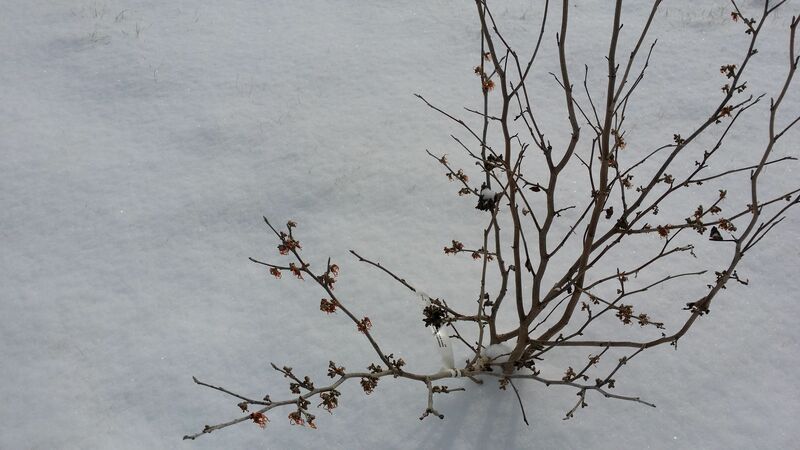 Lovely apricot colored ribbons of flower are covered with snow. The whole shrub just glowing. Perhaps by next year I will have become accustomed to this. It will seem commonplace. (I doubt it). But right now, the first time, it is thrilling. This entry was tagged Hamemalis Jelena, snow, witch Hazel. Bookmark the permalink. some weeks ago I contacted you asking fort he picture with carex. You were interested in my article when it ist finished. It is already published and you will find it in the attachement. Dear Ms. Mader. I would very much like to see the published article, but unfortunately there was no attachment. Perhaps you can send it again, and possibly, instead of to my WordPress blog address send it to me at cgillis@architetto.com. There may be some conflict within WordPress that prevents it coming through. Thank you for your interest. Lovely Witch Hazel! It is thrilling. I’m still getting used to the things that flower on the west coast that the east coast temps would not allow. We do get frosts, but not every year, and when they hit they devastate. So it’s especially touching to see the blooms in snow, and the gardener not panicked but knowing. Thanks Barbara. So many things here have been unexpected — impermeable clay soil, devastating rabbits, prairie winds — that I am enjoying what WAS expected. In a few years the shrubs will be 10 – 15′ high and make a complete, fragrant grove. I can hardly wait!